The main specific design feature of Automatically Compensated Spatial Catenary (ACSC) is a new arrangement of the location of the contact wire and the messenger wire. There are several modifications. The basic design of an ACSC is shown below. With the messenger wire and the contact wire being fixed rigidly onto the anchors the catenary seems to be non-compensated in terms of its form and implementation but in terms of its operational features it is indeed compensated. At a loaded status the contact wires generate load which is transferred to the messenger wires causing thereby a cer­tain deformation of the latter. This load consists of two forces - a vertical force stemming from the gravitation force of the contact wire and a horizontal force stemming from the force generated by the zigzag of the contact wires. As the temperature goes up the sagging of the messenger wires increases in the vertical plane while the wire goes down. The contact wires are expanding under the temperatu­re impact as well as their tensioning declines. Due to this the angle of sagging of the contact wires changes at the fixing points and the horizontal forces affecting the messenger wires change correspondingly. Consequently the load upon the messenger wire increases as a function of reactional forces caused by the changes of the angle of fracture of the contact wires. Similar processes take place in the messenger wires but the forces resulting thereof remain balanced. The precise cor­responding of the changing forces to the temperature-ef­fected expansion of the components of the system depends on the type of material used and on the specific design features of the catenary which are determined through calculations. The expanding of the anchor sections on mainlines makes it also possible to do away with such a complex problem like their interfacing. Also there is no need any more for a fre­quent adjusting and the reliability of the catenary as a whole has been improved since most of the damages of current collectors take place at the points of power supply section in­terfacing. Increasing the length of the anchor sections in a combination with the self-compensating feature of the spatial catenary when installing it in tunnels makes it possible to reduce construction work considerably. This is attained because cells for the housing of compensators can be dispensed with since any distance of the tunnel can be spanned with a single anchor section. The spatial rhombic type of catenary is void of supporting wires as well as other fixing components which are part of the conventional type of catenary of mainlines. Due to this maintenance operations become much simpler. There is no need for any periodic adjustment whatsoever. The posi­tion of the contact wire is adjusted in the longitudinal and transverse planes during its installation only. In case of damages the zone affected is limited this is another most impor­tant operational feature. For instance, in case of disruption of one of the con­tact wires of the spatial rhombic type of catenary the tension is redistributed through articulated strips between the second contact wire and the messenger wires. The zone affected by the damage is limited to one link only. The length of the zone remains the same even if both contact wires are disrupted and this is due to the rigid fix­ing of the messenger wires at the suspension points. Thus, the length of the zone affected by a damage of the contact wires of the spatial-rhombic catenary is 15 to 20 times shorter (depending on the length of a link) com­pared to the vertically suspended type of catenary. 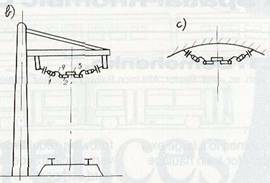 One of the most important features of any catenary designs is the change in the tension of its wires caused by atmospheric impacts that is by the impact of the temperature and by the load caused by changing the length of the wires, their positioning and tensioning.